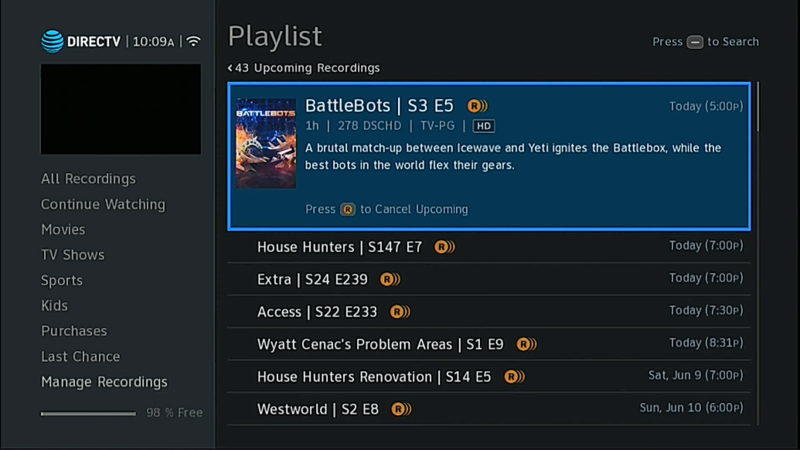 DIRECTV’s new user interface continues to be a polarizing force over six months after its release. While some really love it and have embraced it, over 12,000 people have taken to this blog alone to find out more and comment on what they like or don’t like. Most often, the comments turn to “where did they put the…” and that’s where I come in. I get it. I’ve often said that major software upgrades are like someone coming into your home and rearranging the furniture. It just takes a little while to figure out where everything went. 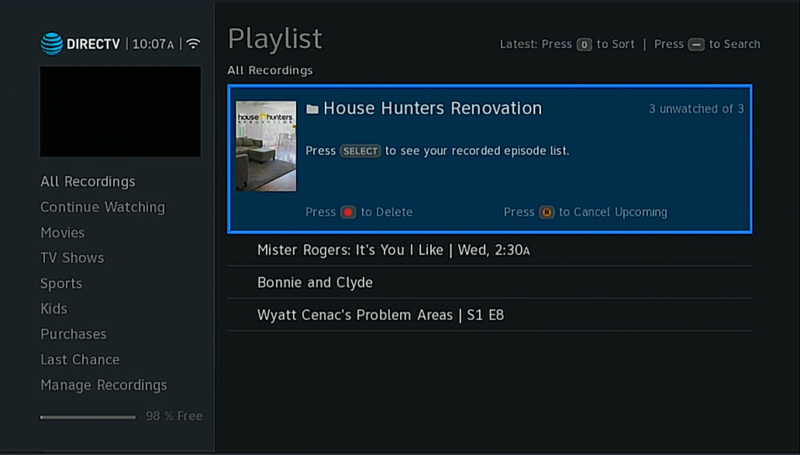 In this case, it’s the “To-Do list.” DIRECTV DVRs have always had a feature that lists all upcoming recordings. I rely on it as a sort of personalized TV Guide, where I can see what’s coming up. Back in the early days of the DVR, careful management was needed. You could only record two things at the same time. This meant there was a chance something wouldn’t record. Not only that, bad guide data often meant that your (relatively small) hard drive could be flooded with reruns. With the drive full, older recordings could be automatically deleted to make way for new ones. 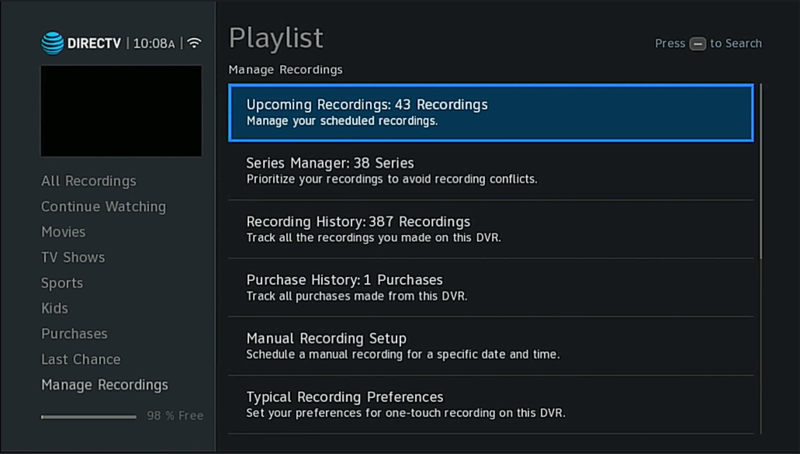 The first version of DIRECTV’s DVR software made it easy to get to the To-Do list. It was a simple shortcut: LIST, then YELLOW. A later upgrade made it harder, unfortunately. A few enthusiasts suggested using LIST, then LIST to go there, but truth is it wasn’t really needed. By that point the DVR was reliable enough that people didn’t go to the To-Do list every day. At least regular people didn’t… I did. I very rarely have to “manage” my To-Do list. Yes, there are a few cases where bad guide data means it gets full of reruns but those reruns hardly ever record anymore. 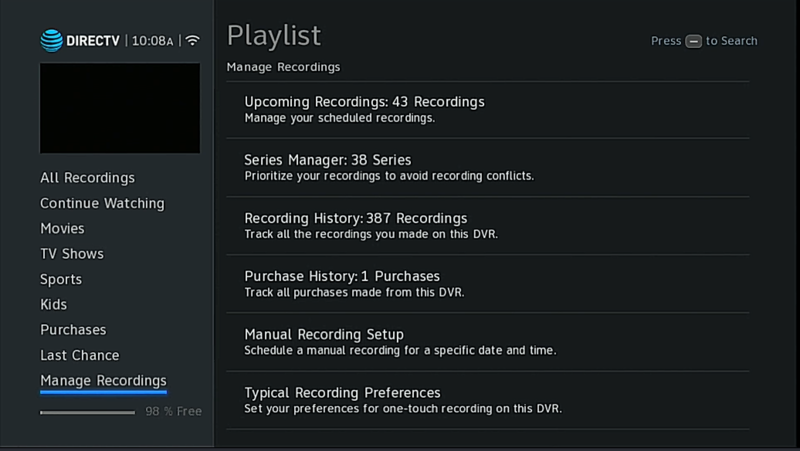 I don’t know exactly at what point, but eventually the DVR gets enough information to exclude them. However, if you are the sort of person like me, who wants to get to the To-Do list, it really isn’t that hard. Start by pressing the LIST button. 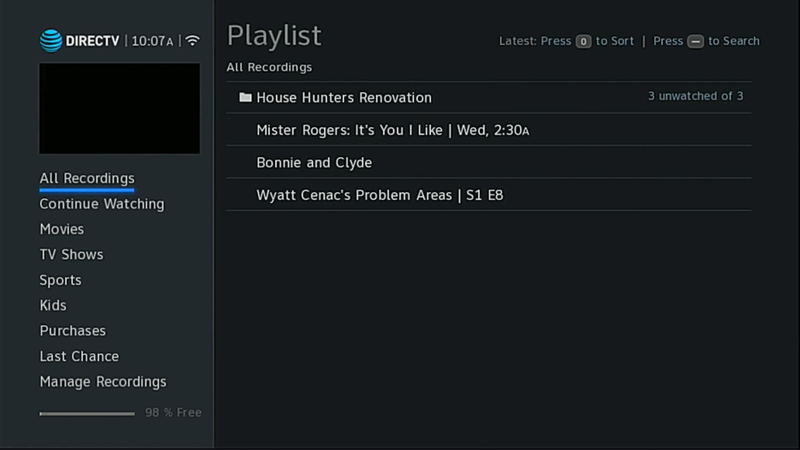 Or, if you want, you can press the MENU button and arrow down until you see the playlist. From there choose “View Playlist.” Either way it takes you here. You can also press the CH DOWN button once to go to the bottom. Same thing. Press SELECT and “Upcoming Recordings” will highlight. Press SELECT again and you’re there! From here you can delete upcoming recordings by pressing the orange R button (the record button.) You can delete an entire series link here if you want, so be careful. When you’re done, press EXIT to go back to live TV. Getting to the To-Do list is very simple. You’ll probably never need to do it, but now you know how! Here’s a video that shows you the same thing.